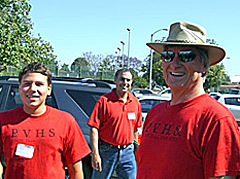 The Palos Verdes Institute of Technology (PVIT) is the award-winning engineering program of Palos Verdes High School. It is composed of two parts: a program of academic study and Engineering Advanced Projects, a distinguished program of project-based activities. The PVIT academic program, based on the nationally recognized Project Lead the Way (PLTW) curriculum, is open to all students at PVHS, and Engineering Advanced Projects, the PVIT “club”, is open to any high school students at PV high. 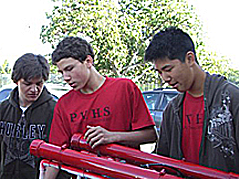 A little background — after PVHS reopened in 2001, PVIT became the only high school program in the United States to field a DARPA “Grand Challenge” autonomous vehicle. Competing with entries from top universities, such as Cal Tech, MIT, Virginia Tech, and the wining vehicle from Stanford, the PVIT vehicle advanced to the second round of competition. With this established record of success, the PVIT program evolved further to offer pre-college engineering courses while continuing opportunities for engineering competitions, internships, mentoring and research. Currently, PVIT offers a four-year engineering curriculum starting with Introduction to Engineering and culminating with Engineering Design and Development, the PLTW capstone course. The Engineering Advanced Projects program has grown to over 170 students meeting every Sunday to learn and experience hands-on engineering. Students obtain invaluable skills and knowledge while solving real-world problems, often posed through engineering competitions, while being mentored by award-winning teachers and some of the top engineers in our community who have over 500 years of engineering experience combined. Where else can a high school student build an electric vehicle, fabricate an underwater robot for marine exploration, program an autonomous ground vehicle guided only by sensors and GPS, launch, track, and recover a high altitude balloon to 100,000 feet above the earth’s surface, optimize a solar-powered boat for racing, or design autonomous quadcopters for search and rescue missions? PVIT is technically extensive, unlike many other high school programs nationally, with over 15 main teams to excite each students’ technical interest. PVIT projects have continued the legacy of excellence by placing in international and national competitions, often against universities or private robotics corporations. Come join the fun where you can truly experience real-world engineering in a unique environment that is entirely student-centered. We invite you to stop by any Sunday, 2:00 – 4:30 pm, to see the new ideas and projects we have going on. What: You can join a team and do fun hands-on engineering projects.